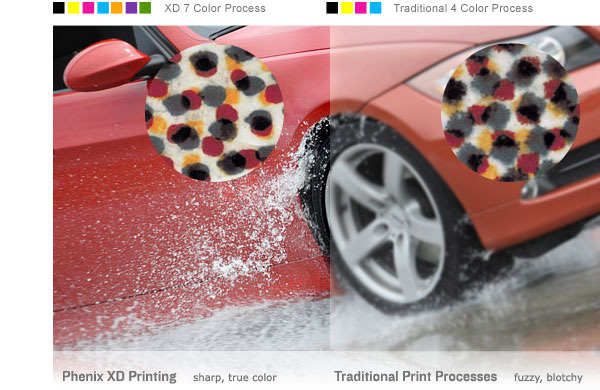 Phenix XD print quality (left) provides less dot gain, more vivid color, and more flexible printing options on a variety of substrates than traditional print processes. We take custom, just-in-time printing solutions to the extreme. Not all label printers are created equal. At Phenix, we deliver the total package, from design to production to final delivery. Our packaging design experts work within your needs and budget to select the printing processes, materials, coatings, finishings, and customized solutions that will pump up the wow of your label and package design. Using the latest printing technology, we offer the highest resolution, full tonal range, and unsurpassed color brilliance on a variety of substrates, including cellophane, metallic films, non-porous materials, paper, and films. With variable data printing processes, we give you the flexibility to change graphics, text, photos, logos, and bar codes between lots and during each press run. With Phenix Xtreme Definition Printing, you get complete customization, quick turnarounds, and up to 99 percent less substrate waste than conventional techniques. We encourage you to see the difference for yourself.